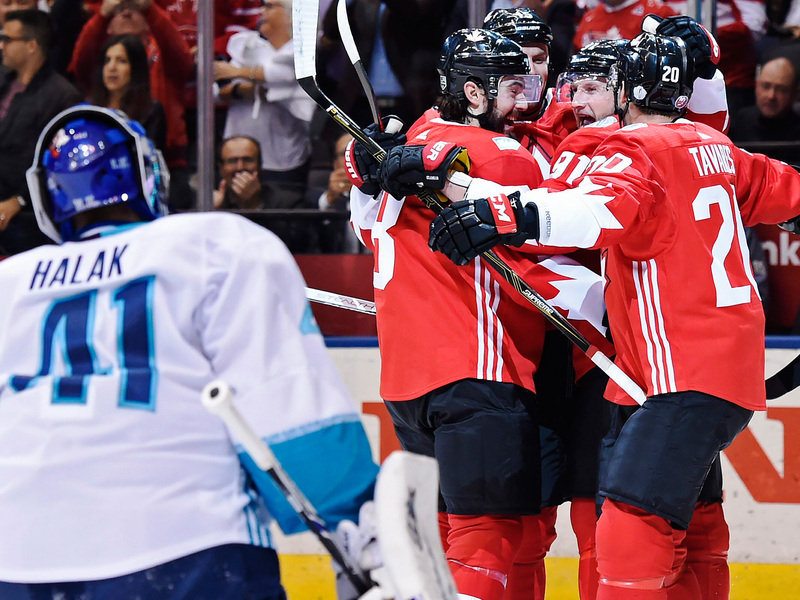 Team Canada didn’t put forth its best effort in Game 1 of the World Cup of Hockey finals, but such is its strength that it still cruised to a 3–1 win over Europe. TORONTO — The luxurious existence of being Team Canada means awaking after a half-hour snooze with unblemished skin, perfectly coiffed hair and little to no eye gunk. It means allowing two scoring chances and committing one penalty on the opening shift, yet still leaving Tuesday one victory away from snatching the 2016 World Cup of Hockey. It means having the globe’s best goalie as a safety valve, and its best player as a sparkplug. It means getting the decisive goal from its second-line right-winger, who’d previously been held scoreless this tournament, and having that person be Steven Stamkos. On the other hand, the margin for error against Canada remains skate-blade thin. Twelve seconds after Marchand left the penalty box, Bergeron found him on a backdoor feed after Sidney Crosby’s seam pass sprung him free. Later that period, when defenseman Zdeno Chara tried squeezing past Getzlaf in the neutral zone, a swift stick-check from the Anaheim captain turned into an odd-man rush and Stamkos’s game-winner. Then came Crosby in the third, shaking off defenseman Mark Streit behind the European net, dancing around an official and finding Bergeron with a tape-to-tape backhand pass. The opposite bench shared in such irritation, but for different reasons. Price was excellent, allowing only Tomas Tatar’s third goal in two games when a blocked attempt bounced straight to his stick, but was relied upon more than in round-robin play. In his postgame presser, Babcock criticized his team’s zone exits (“went back and forth”), entries (“turned the puck over”) and communication (“didn’t talk to one another”). Only in the final minute of the middle period, while killing Marchand’s second minor, did Canada finally assume the shots on goal lead. Sounds pretty nice, this inevitable success. Almost luxurious.